I don’t think it sounds like I would much like the book, either, based on some of what the review says. I have not read it. 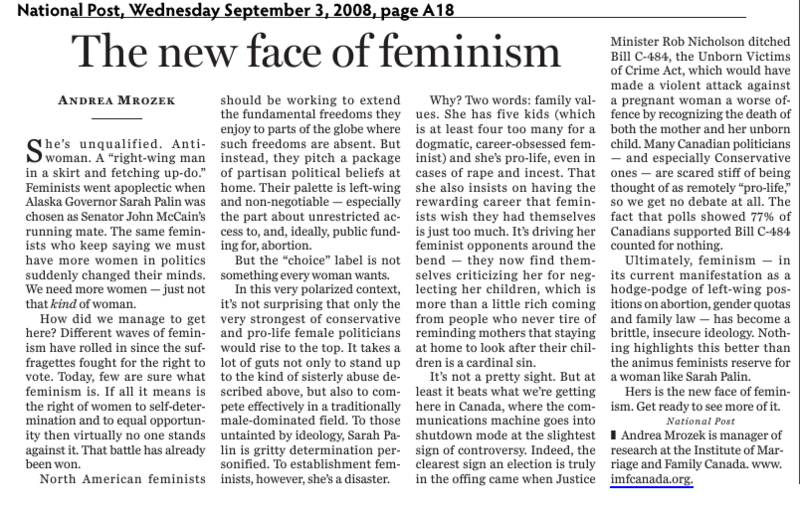 That said, I do not like the Pill and it’s true, I believe it is anti-feminist, for lack of a better term. Nothing reduces a woman to mere physical/biological function more than taking a Pill every day that suppresses her natural cycle. Furthermore, there is nothing quite so empowering as knowledge. Knowledge of how your cycle works, what it says about your overall health, and having control over that cycle without Big Pharma’s assistance. The review asks some valid questions, however. One of which is why is the Pill so popular? I believe it is because it is very much promoted in med schools which look to pharmaceuticals for solutions. Doctors are schooled first, later wined and dined by pharmaceutical companies. They are not schooled or wined and dined by Creighton practitioners, for example. But still, word is getting out there. Any when women discover the many myriad benefits of actually learning more about their own bodies, I believe they will leave the Pill behind. It won’t be because it is capitalist, or anti-capitalist. (Please.) It will be because it improves our overall health. And because it feels good to be able to take care of yourself and be treated like a human being by someone who actually cares about what your cycle is doing, rather than simply suppressing it. Bear in mind some of us are using the Pill to regulate our periods. I’m not sure what other solution there is for a woman whose period is so irregular that most of her life it has only occurred every two months or so and once disappeared for six months. The problem could be caused by stress or other factors. When my period finally arrives I bleed for a month – and it’s heavy and painful. So rather than seeing the Pill as something that’s ruining my health, I’ve seen it as a means of improving it and having my system actually functioning normally. Who knows? Maybe I’m damaging my body. Time will tell. But I thought I’d point out the Pill has another use than just a contraceptive. It’s often prescribed to regulate a woman’s internal clock. I’d suggest meeting with a Creighton/NaPro Tech physician. If it’s a hormonal thing, they can probably help you get to the root of the problem and help you heal. Myself and a number of good friends have been blown away by our experiences with Creighton-trained doctors. A few of us have been suffering from undiagnosed hormonal problems for years, having seen multiple doctors, and it is only these doctors that have figured out the root problems. Jenny, I was going to add that there are moments when the Pill is useful. But it is over-prescribed, often without ever even attempting to find out what is causing the problem. As a teen I was put on the high dose BC pills, Depo provera shots to regulate cycle. Resulted in uncontrolled hemorrhaging, D&Cs and then when I went to college and stopped the drugs….3 years of nothing before I started cycling on my own. Yes, I was suicidal and depressed during those years. I believe that I went through puberty at age 18-21 because my system was so messed up by the drugs. I insisted on using Natural Family Planning and spaced my kids, 2-4 years apart. 12 years later I hemorrhaged again during childbirth. Pituitary became necrotic and now I have Sheehan syndrome- panhypopituitarism for life. Janice’s experience is far from typical. Most people on the Pill – to regulate their periods or otherwise – do not experience hemorrhaging or become suicidal.